This bottom-feeding large capacity tank (3.5ml) clearomizer system is 510 eGo threaded and will fit on any of your eGo batteries. 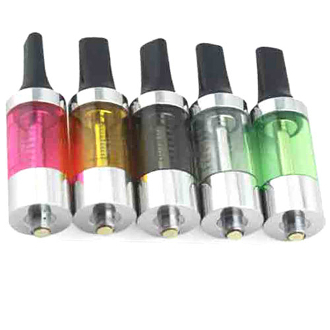 It is a powerful clearomizer that produces clouds of vapor and amps up the flavor of your e-liquid. As well, the BCC Clearomizer is rebuildable. This means you may remove and replace burned out coil heads instead of having to replace the entire clearomizer. It is made of durable, high-quality plastic and stainless steel and comes in several bright colors. You can also replace the flat plastic mouthpiece with a 510 drip tip if you'd like to customize it further. Overall, the BCC Bottom Feed Clearomizer Tank System is not only powerful, but also affordable and a fantastic addition to your vaping experience. Turn the clearomizer upside down. Unscrew the metal bottom base. Unscrew the old coil head. Attach a new coil head and replace the bottom base.